If your horse is not working up to his potential or is stiff and reluctant to move forward, you might want to consider a chiropractic work-up. Back pain, poor performance, or bad attitude could be related to what is called a chiropractic subluxation. The term "subluxation" as a chiropractic term should not be confused with the medical definition. A chiropractic subluxation is the alteration of normal dynamics, anatomical, or physiological relationships of adjacent articular (jointed) structures. The medical definition of subluxation is an incomplete or partial dislocation. Back pain occurs when chiropractic subluxations cause inflammation around the nerve roots as they exit the spinal cord via the small intervertebral openings. This inflammation initially causes nerves to become hyper-reactive, which leads to muscle spasms because the muscle cells are constantly being signaled to contract. If a subluxation exists for an extended period of time, however, the nerve may be permanently damaged and lose function, and without nerve stimulation the associated muscle will atrophy. Chiropractic subluxations cause interference with nerve transmission just as turning the dial on a radio causes the signal to fade in and out. If your horse is not getting clear signals through his nervous system, how can he respond appropriately to your signals? When choosing a chiropractor, it is best to find one that has completed a post-graduate course such as the American Veterinary Chiropractic Association (AVCA) certification course. This course teaches a very safe, low force, high-speed method of adjusting individual vertebral segments. A good practitioner will use speed and skill, rather than force, to make adjustments. The chiropractic method I use is called network chiropractic. It addresses both type A and type B subluxations. A type A subluxation is usually the result of some physical concussion or other kind of physical stress. For instance, repeated concussion from landing over a jump or repetitive stress on the joints from barrel racing may cause type A subluxations. This kind of physical stress can cause one or more of the vertebrae to become misaligned. When the vertebrae are misaligned, the resulting inflammation and soft tissue swelling can cause pressure on the nerves along the spinal cord and interfere with the transmission of nerve impulses between the nerve cells and tissue. The second type of subluxation, Type B, involves the spinal-meningeal sheath, which is the membrane that surrounds the brain and spinal cord, and the connective tissue that attaches it to the spinal cord. All of these are associated with the horse's neurological system. Emotional or chemical stress can overload this system, resulting in stress on the spinal cord. The body tries to reduce this stress by moving vertebrae out of alignment. Both Types A and B result in misaligned vertebrae, but the causes are different in each case. 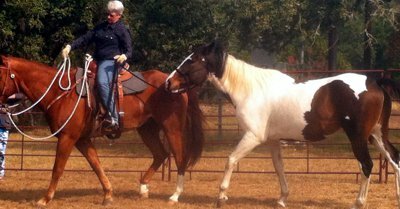 Many horses appear to experience emotional stress from training and showing. This type of stress can create meningeal tension which can be addressed by network chiropractic. The network approach of adjusting uses gentle contacts of a nonspecific nature made in specific areas with the intent to remove tension in the brain and the spinal cord itself. Once the tension has been released, the natural movements of the horse will allow the vertebrae to return to normal position.